Al’s Landscaping in Regina offers all types of landscaping services for residential and commercial properties in Saskatchewan. We’ve been serving the area for over 50 years with a professional, experienced team of landscapers. We provide complete landscaping Bobcat services, which include excavation for building a deck or in-ground pool. We also install black dirt, pea gravel, mason sand, top soil, and pulverized dirt. From building a customized deck or patio to repairing concrete driveways, we have the equipment and resources to lay the groundwork for any project. When you need large quantities of landscaping materials, we provide delivery services for topsoil, gravel, mulch, sand, and rock for homes and businesses. Our drivers will schedule a convenient delivery time and unload the materials to your specifications. 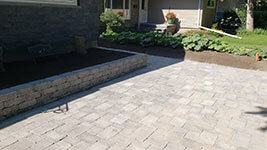 Al’s Landscaping team also designs and installs paving stones for pads, walkways, and driveways. These include symmetrical or natural cut stone patterns. Paving stones add definition to your garden, yard, or patio and are resistant to weather damage and excessive moisture. We’ll create a custom design that is unique to your property. If your home or business sits on a hill or has uneven, varying ground levels, our Regina landscapers provide yard leveling and grading. This process makes it easier to install above ground pools, gardens, patios, sheds, and other landscape structures. It can also prevent soil erosion and create stability for outdoor activities. We also deliver and install aggregates, including crushed stone. These include course and fine mixtures of sand and gravel. We also install mixed soils. Our landscapers also employ xeriscaping techniques, which are used in gardens, lawns, courtyards, and other areas with vegetation to conserve water. Xeriscaping arranges drought-resistant plants in an efficient layout, combining them with plants that need more water in a way that uses less water overall on the property. 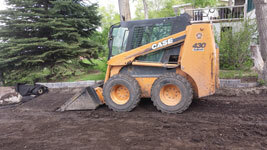 Al’s Landscaping in Regina provides dirt ground sod to repair grass and install complete lawns for any type of property. Sod is available in any quantity and can be cut to precise measurements to suit the needs of your lawn. From defining property lines to keeping your pets safe and secure, we install vinyl fencing for homes and businesses. Available in several heights and in colors ranging from white to black, our landscapers create a custom design, whether you’re looking for functionality, intricate details, or both. Fencing can be built with gates and arbors, with materials such as chestnut, dogwood, arrow wood, aspen, lattice, and many others available. Boulders have become a popular way to mark the entrance to a property, from homes to subdivisions and businesses alike. Our landscapers in Regina also install water features, including elaborate stone fountains, waterfalls, and much more. From a small statue in your flowerbed and more. We can design a custom water feature for your home or business. Stone planters are a sturdy, weather-resistant option for growing large plants, trees, and flowers. We deliver and install stone planters of any type, and also build retaining walls. From protecting a small flower bed to maintaining soil integrity for large commercial properties, we can create the brick or natural stone retaining wall you need for your landscape. Al’s Landscaping offers free estimates on all projects large and small. Contact us to schedule an appointment and scope out your project today.